The Grant Nelson remix still doing it for me in 2019. Great stuff. 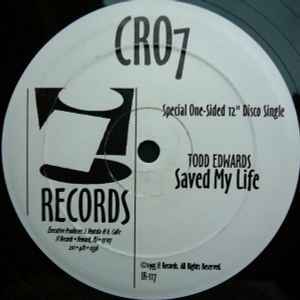 Seminal Todd Edwards. Hard to believe it's pretty much twenty years old! I have completely worn out my copy. Samples used to perfection, deep rich bass, quite different to his remix work. Timeless classic, I'll be playing it for another twenty years to come no doubt! What is there to say really. Stone cold classic. Raw drums, deep bass, just enough quirky trademark Todd Edwards samples and absolutely brimming with emotion. Can honestly say I've played this record many many hundreds of times, will never tire of it. I did read that Todd sampled his father singing baritone for the oooooh part. Can't believe it has taken until the end of 2013, almost twenty years since it was released for someone to leave a review.